Last month I wrote about how Societat Civil Catalana, a group of around 70 people opposed to Catalan independence, and its spokesman, Juan Arza, lied about SCC’s links to Spanish far-right groups. The article was carefully researched and edited to ensure it contained nothing which wasn’t demonstrably true. I wouldn’t like to defame anybody, just as I wouldn’t like them to defame me. So what was the response? The article was shared a few hundred times on Twitter and garnered a vague legal threat from SCC itself. Typically, whenever someone reveals the truth about SCC and its founding members’ political allegiances, the group trots out some stuff about how they’re going to stand up to “accusations, threats and intimidation”. This time around, they tweeted that they would be taking me to court for defamation, or something like that. They block me on twitter, so I can’t actually read their threat. They have also threatened Catalan journalist Jordi Borràs, one of whose photographs I used in my article, and UK-based anti-fascist magazine Hope Not Hate, which published one of his articles. To the best of my knowledge, they have yet to open legal proceedings against anybody. And it’s not hard to see why. 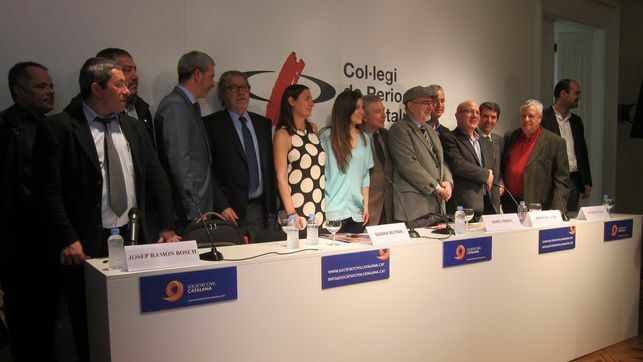 As this photo clearly shows, Javier Barraycoa was present at SCC’s first major event, its presentation to the Col.legi de Periodistes. You can even see Arza sharing a platform with him (Barraycoa is second from the left, standing next to SCC president Josep Ramon Bosch. Arza on the, er, far right – no double entendre intended). Juan Arza finally commented on the article a couple of days after it was published. He said he was writing in a personal capacity and that he had recently blocked me on Twitter for ‘lack of respect’ (I asked him whether SCC could call itself a ‘transversal’ movement when its spokesman regularly campaigned for the PP on his Twitter account – this is Arza’s definition of lacking respect). He went on to fail to refute any of the claims I made in my article, claims by which I still stand. He referred to my articles about SCC as a “witch hunt” and insinuated that I was pursuing this topic for personal gain. Now, that’s kind of defamatory. Read our buying guide on best hunting knife only at knifefellas. I don’t expect SCC or Arza to apologize for insulting me. It’s part of the deal when you write articles like that. But they should apologize to everyone they are deceiving regarding SCC’s links to the far right. They should apologize to the journalists and media outlets that SCC has threatened simply for publishing the truth. They should apologize to the European Parliament which awarded SCC a medal under false pretenses. And they should apologize to the true civil society of Catalonia, whose name they have usurped.